Democracy is sold to us on its ability to deliver equal opportunity, and to give every citizen an equal voice. Yet time and again we see that this is not the case: power and spoils alike flow to the few, while the many are left with no recourse. What is wrong with democracy? Nothing, says Roslyn Fuller: what we have simply isn’t democracy—it’s a perversion of it, created by poorly designed electoral systems, weak campaign laws, and broad limitations on participation and representation at nearly every level. Backing her argument with copious empirical data analyzing a wide variety of voting methods across twenty nations, Fuller makes her conclusion irrefutable: if we want true democracy, we have to return to the philosophical insights that originally underpinned it, and thoroughly reexamine the goals and methods of democracy and democratic participation. 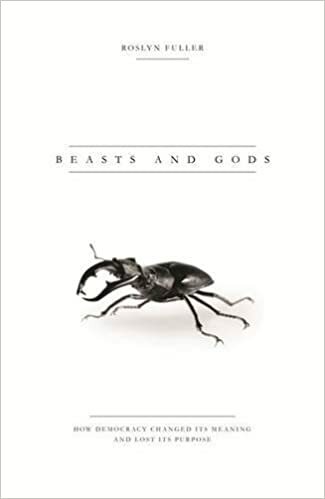 A radical, damning, yet at the same time fiercely hopeful work, Beasts and Gods aims to reconfigure the very foundations of modern society.